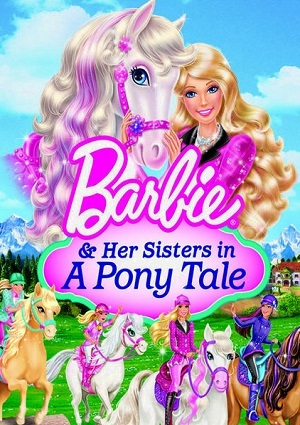 Barbie and her sisters decide to spend their holidays in her aunt’s Marlene riding academy, where they plan to improve as riders and enjoy of a wonderful season, Barbie wants to use the trip to find a horse that she can take with her to Malibu and be her companion during competitions. Barbie, Chelsea, Stacie and Skipper seem to enjoy the first days at the academy and with Aunt Marlene; however economic issues have come to the school and the girls are willing to help in any way they can. The opportunity will come for Barbie and her sisters with Inter Academic Equestrian Tournament because the prize can save from financial crisis the Alpine Academy, so the girls begun the arduous training to beat the rival school. However, Barbie must know a living legend, one of the greatest horses that ever existed: The Majestic. Apparently a horse that was only part of the warrior princesses’ stories, but she manages to make a friendship with horse. Barbie does not want to interfere with the quiet life of this wonderful specimen, but trust and friendship between Barbie and Majestic reaches its climax on the day of competition. What will happen to the two friends?